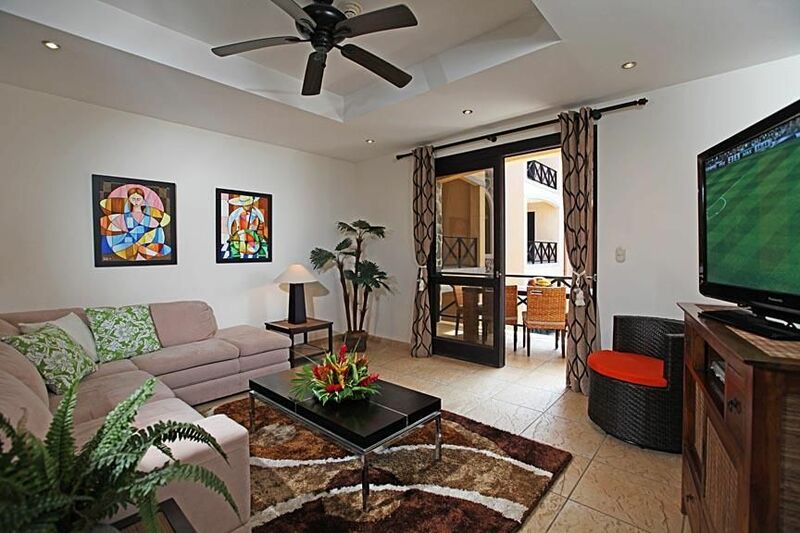 This tropical 3 bedroom 2 1/2 bath vacation rental, located on the third floor at Bahia Encantada, offers beautiful ocean and pool views from its terraces. -Spacious living room with comfortable sofas and large flat screen TV. -Terrace with an outdoor dining table. -Master bedroom furnished with a king size bed and private bathroom. -The second and third bedrooms have a full sized bed and they share a full bathroom. -Half bathroom in the living area. -Fully equipped kitchen with stainless steel appliances, large fridge with ice maker, microwave, range with oven and dish washer. I'm a 26 years old local Costa Rican that have been helping people have the best vacations in Costa Rica for the past 5 years so I know all the best places and people in town. I live in Jaco, 5 minutes away from the properties we own. I'll be glad to help you with everything you will need during your stay: from arranging your transportation from and to the airport, stocking your condo with groceries, recommending and arranging for you my favorite activities (like tours, surfing or fishing), arranging for a massage right in your accommodation or anything else you might need to have the best vacation in my beautiful country! Bahia Encantada is close to the center of town so you can take a cab for just $2 to go to the restaurants, bars, shops, etc. It is also right on the beach so you can surf right in front of the condo, go for a walk on the beach or watch the amazing Jaco sunsets. Bahia Encantada is the perfect location for doing all the activities that make Costa Rica famous, you are minutes away from the rainforest, the zipline tour, the ATV, rafting, you can surf great waves right in front of the condo and much more. Best in Jaco, great service, great condo! This is the first time we have booked through Homeaway.com and we didn't know what to expect. Well, the staff at Best in Jaco made the process very simple. They also went grocery shopping for us so we had food in the condo when we got there, (for a fee). We loved the accommodations. Three good size bedrooms. Full kitchen and a washer and drier. We spent our days going on tours. We loved the town, Jaco. And when we come back, (no if's about it) we will definitely stay at this property again. Great family atmosphere. You will fall in love with this town. Thank you Love for the great review, we really appreciate it! We are so glad you guys enjoyed your vacation in Jaco and loved the condo! We really hope to have you back any time soon. Bahia Encantada is "Pura VIda"
Bahia Encantada D3 was an incredible condo! It had every convienience you can imagine. The pool was perfect, with just a few steps away from the ocean and hearing the waves crash at night was the icing on the cake. The staff lead by Katia was professional, curtious, and friendly. I would strongly recommend this condo...resort to anyone who wants to enjoy the lavish comforts of the oceanfront. Thank you Kelly for the awesome review we really appreciate it. You guys were nice and easy to deal with, we really hope to have you back! Great property on the beach. We found the property as listed, it's a good find. The properly was very clean and Best in Jaco was very accommodating and reacted instantly for any of our requests. We strongly recommend Best In Jaco especially their office crew, Katia, Maia and Fernanda. Thank you for staying with us :) we really hope to have you back here soon. The Name says it all "Best in Jaco"
The name does say it all. Best in Jaco. From the beginning the whole reservation process was flawless. Katia & her staff were great and extremely helpful from the beginning. There definitely a full service one stop shop for all you need in jaco. From the day of arrival they made arrangements to have the keys available to the unit with the guard desk as we were coming in late from SanJose. The Condo was perfect and exactly as described in the add all modern amenities. Great open layout of the resort and Pools. Location is also perfect right on the beach and the strip was within walking distance about 15 min. We also utilized them for tour of ATV and that was amazing as well. From beginning to end Best in Jaco met and exceeded our vacation needs. GREAT JOB! There were 5 in our group and this was a perfect spot for us! Beautiful condo, gorgeous view of the pool area and the beach, within easy walking distance of town. There was a little local restaurant-bar right next door and we walked over every evening for a sunset drink. Our activities included ziplining, ATV's, Turtle Tour and a day to Quepos/Manuel Antonio. All activities were easy to access and very fun for all. Fabulous vacation!